Home > News > CSR > Ready,Steady,Go! 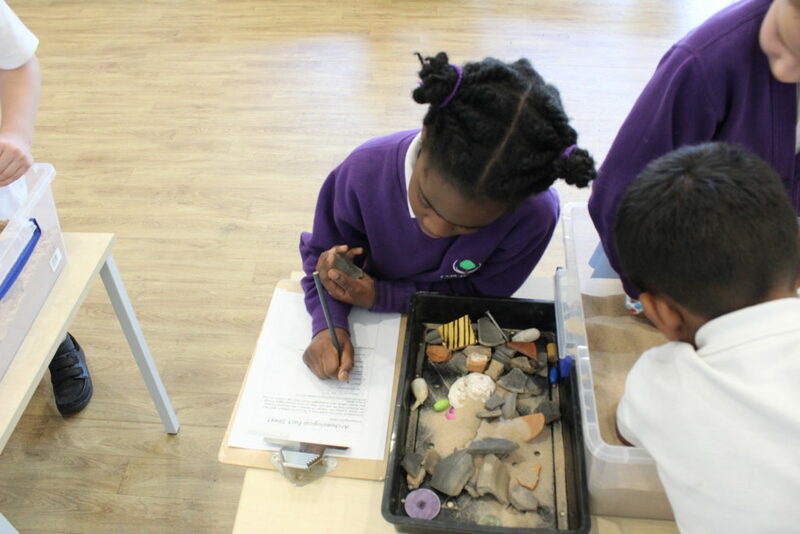 26 children across years 1, 2 and 3 recently enjoyed an action-packed morning during a hands-on archaeology session organised by our Director of Post Excavation Services, Janice McLeish. The children enjoyed a range of archaeological and environmental activities including making clay pots (coil or thumb), arranging a cow skeleton anatomically, mini-excavations (using buried finds in sandpits), guessing the age of an artefact and using tweezers to sort and identify a selection of environmental finds. Assisting Janice from Border were: Chris Faine – Finds Manager, Susanne Larsson – Finds Supervisor, Anna Rigg – Environmental Science Assistant. The school stands on a site excavated by Border Archaeology where evidence of Iron Age and Romano-British settlement was recorded. Border Archaeology is committed to community involvement. This includes engagement with local parties to provide an opportunity to appreciate the archaeological finds within their locality.